Although Cinemascope was the first of the new widescreen processes to hit the screen with the high-profile The Robe in 1953, a rival technology called Cinerama was premiered in September 1952. By using three adjacent 35mm cameras, an extremely wide image could be created. It actually required five projectionists operating three projectors to view these films. Uniquely the image was projected onto large screens that was literally curved. This would provide the viewers with a spectacular, almost three dimensional, image. Outside of exotic travelogues intended to exploit the Cinerama experience (much like many IMAX films today), only two fiction films were shot in genuine Cinerama: How the West Was Won (1962) and The Wonderful World of The Brothers Grimm (1962). Later films such as 2001: A Space Odyssey (1968) were filmed in Super Panavision 70 and then presented in a 70mm Cinerama image rather than the 3-Strip image of the original films. It will be interesting to see how effective this new stab at old technology is, but it sounds like an admirable attempt to present How the West Was Won as it was originally meant to be seen. Until then you can find more information on Cinerama, including some great stills of film frames, at the highly recommended Widescreen Museum. Hello from a Widescreen enthusiast. 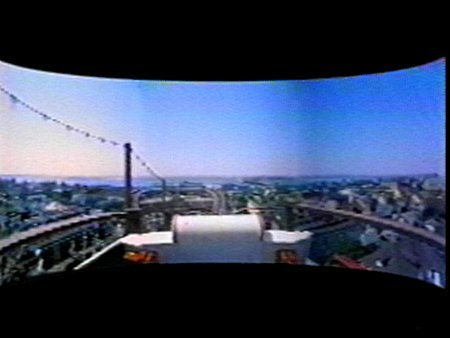 In Rhode Island there once was the Hope Street Cinerama, and the three Cinemechanica projectors were all in one large booth. It was fun to watch the reel changing at intermission. The hour-long reels were pulled up on a chain at each machine because they weighed too much for lifting by hand. The movies were truly something to behold, especially the buffalo stampede and the train chase in “How The West Was Won”. The Widescreen Museum also has links to the DP70 projection story. Fascinating! Cheers from Ralph Baker at http://draaiorgelfan.wordpress.com. Now playing: “Wanted – The Dean Martin Show!”.